A good emergency radio that can be run on a variety of power sources is something you should consider adding to your preps, so you can stay informed and entertained. In this post, I have attempted to throw a few ideas out there for affordable, best emergency radios to add to your preps. An emergency radio needs to have little demands in terms of power consumption. It is best if there is some way to have an energy source like a hand crank or a solar panel built in. If you have a battery-powered radio then go for one that takes AA or AAA batteries since they are the most common battery sizes and easier to find. It is also easy to store some rechargeables and keep them topped off with a solar battery charger for use in multiple devices. Some radios have a NOAA weather band, AM/FM, shortwave, and a public alert band while others may have only one or two of these features. Make sure to read the fine print so you know what bands you are getting for your money. Personally, I don’t care about AM frequencies but the other bands may all be quite nice to have in a major emergency or when hacking it out in the bush. Like any electronic device you can pay a little or a lot and while there is something to be said for the saying ” You get what you pay for”, sometimes this is not the case. Just look at the cost of cell phones. My $30 Smartphone from Virgin Mobile laid out in the vineyard and went through rain and animals grazing for a month and it still works. Try that with a $600 iPhone and see how that turns out! When it comes to the best emergency radios, you really don’t need to spend more than $30-$80 to get a multi-purpose unit. A speaker can only do so much and the same goes for an antenna. You may also want to be able to put your radio in a smaller pocket on a pack or you may simply be pressed for space because you are prepping while renting or have to travel a lot. Some radios are not much bigger than what will fit in your hand and they have a lot of function but the speaker is going to be small. If you think radio might be part of your SHTF entertainment or are going to be sharing with the family then either have a compatible speaker or get a slightly larger radio. Remember that the more powerful the speaker, the more power it is going to consume. For units with solar panels or cranks at least you have a few options for keeping it going. There is a bit of a debate about digital versus manual tuning. I will say that digital has the advantage of being easy and precise. On the other hand, digital tuners have a tendency to not last as long as a tuner that is manual. Digital displays and tuners are more complicated to make and have more components. I had a really good shortwave radio that worked well for many years but the first thing to mess up was the digital tuner. The buttons got stuck and would not stop when I wanted them too. Digital displays often are a clock and you can set an alarm Most radios with manual tuning are not clocks too. 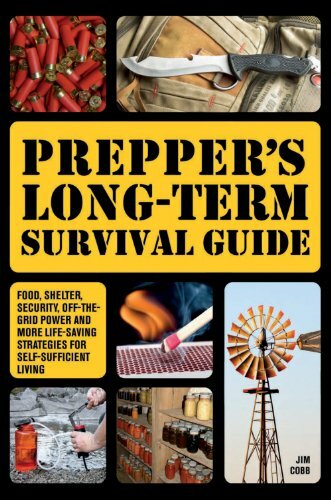 Remember that during an emergency or SHTF scenario, the cell phone and computer clocks we rely on might not be available for all or any of the time. Reception can be affected by a lot of different things. Plenty of people use wires to make longer antennas to get a bigger signal. My Dad would run a copper antenna to the top of the house when I was a kid. Trying to get a signal in a house with a metal roof or that has a lot of barriers in your line of sight can be a problem. There is also the fact that some stations are simply broadcasting a stronger signal so you are going to pick them up better than others regardless of other factors. If you want an extra antenna then I advise buying a kit. They are inexpensive and so easy to order now. No having to put one together yourself! If you do find yourself in a SHTF situation you can strip some scavenged wire and strip the ends to attach to your antennae. 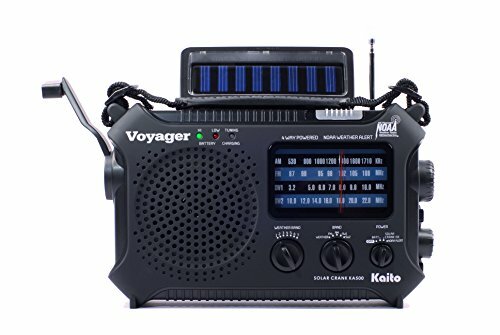 Emergency Weather Radi... Best Price: $38.36 Buy New $45.96 (as of 05:40 EDT - Details) This radio offers many different options for power! It is hard to imagine how you could not keep this radio going in a major situation! This radio features a 4000 maH power bank so you can keep your cell phone or other small device topped off. The radio totally chargers off of solar if allowed around 24 hours but can charge in less time depending on the level of light. The radio itself can run for a full 12 hours on a single charge. This is pretty good especially considering that if the panel is collecting solar energy you are probably going to get more time if listening during the day. When solar is not available you can also run this radio off 3 AAA batteries. The hand cranking option for charging works at a rate of 1 minute of cranking rapidly for 30 minutes of flashlight usage or 15-20 minutes of radio. Oh and you can charge it up via USB too! 7 NOAA weather bands keep you informed of conditions whereas the AM/FM keeps you informed on other matters. Tuning is manual but everything is easy to read. This device is great for those that want to listen to their music or shows. You can use a USB stick with audio stored on it and listen to whatever you want. This means this radio has a lot of potential for entertainment during a situation. Some audiobooks or music could help improve morale. You can also use a TF (Class 10) card. The radio does not have a shortwave band but other than that it has a lot to offer. While the dual speakers are nice you can also use headphones. Extra light is always nice and it is even better when you have so many options to charge it up. The 20 lumen reading light can be angled or you can use the 100 lumen flashlight features. You can get up to 40 hours of light on a full charge. There is an SOS alarm feature if you need to draw attention or even scare off wildlife. Kaito is a name you see a lot in emergency radios. They make a wide variety of styles with various features. This radio will appeal to those that like a more retro radio. You are going to have to turn and adjust some dials to get anywhere with this one. That being said there is the advantage that dials are reliable and last a long time. The Kaito can be hand cranked or ran on the included solar panel. A built-in battery handles the charge for you. Three AA batteries can also be used and can be a nice backup. The other charging options include USB or you can buy a separate AC adaptor. If you need to charge a small device like a cell you can use the radio. While solar is enough, the hand crank option is recommended. This radio offers all the bands you could ask for. From 7 NOAA bands for the weather to your classic AM/FM to shortwave, you are covered. The manual tuning can be a bit frustrating for those used to digital but it gets the job done. 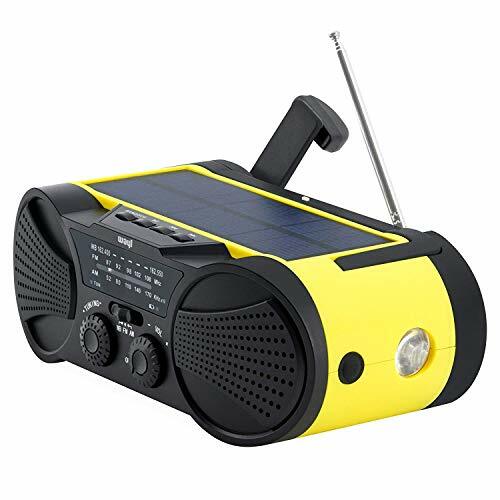 This radio does not offer as much light as some but it does have a reading light which can be helpful during those evenings during an emergency or even just when camping out.